Recently I saw a lovely 9 year-old cat named Mittens for his yearly exam. His owners report he has been doing great, except vomiting more than usual. Mittens was a handsome cat but physical exam revealed a heart murmur and dental disease. I recommended that we do pre-anesthestic blood work for the dental and see if there were any indications as to why he was vomiting. I also advised the owner to see a cardiologist to have the heart murmur evaluated before anesthesia for the dental cleaning. Mittens blood work revealed very mild kidney disease which is an all too common finding in middle-aged to senior kitties. Though we are not yet able to prevent kidney disease, the earlier we detect it, the better chance we have of managing it, which is why we strongly suggest that all senior cats get blood work as part of their regular wellness exams. Clinical signs to look for are decreased appetite, vomiting, weight loss and increased thirst and urination. 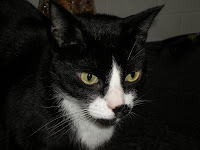 At 9 years old Mittens has just entered into the realm of senior cat-hood but he was found to have three very serious but also manageable diseases. Given his heart murmur and kidney issues cleaning his teeth is now even more important. In a healthy animal (people too) every time you eat bacteria are released into the blood stream. With diseased teeth the amount of circulating bacteria increases, these bugs then lodge in the heart, kidneys and liver. Thus as a veterinarian I don't want Mitten's dental disease to make his heart and kidney disease worse. Isn't it amazing how everything is connected? I feel this is a great example of why annual exams are so important. All of Mittens issues are at the very beginning stages and with proper management we can keep him as healthy and happy as possible.